John Legere of T-Mobile is a canny operator and knows how to play the sycophant to Trump’s nationalist instincts in touting the ability of a combined T-Mobile & Sprint to invest in a super-charged 5G roll out, as per this presentation, playing the job creation and beat the Chinese technological advancement cards. Legere cites an Analysys Mason report commissioned by the US industry lobby group CTIA to back up such claims which in turn cites an Accenture report from 2017 on 5G in the US which claims that “telecom operators are expected to invest approximately $275 billion in infrastructure, which could create up to 3 million jobs and boost GDP by $500 billion”. In 2016, the European Commission in this report stated that 5G “investments of approximately €56.6 billion will be likely to create 2.3 million jobs in Europe”. An IHS Markit 2017 report commissioned by Qualcomm claims that in 2035, “5G will enable $12.3 trillion of global economic output” and “the global 5G value chain will generate $3.5 trillion in output and support 22 million jobs” on the basis that “the global 5G value chain will invest an average of $200 billion annually”. These are fantastical figures. Many assumptions go into their computation including the availability, range and cost of spectrum plus infrastructure spend and policy in relation to streamlining procedures and fee structures for the deployment of the small shoe-box cell sites (between 10 to 100 more antenna are required for 5G than current networks). Larger issues such as privacy and security also need to be addressed before we enter a world of ubiquitous ultra-reliable low latency networks as envisaged by the reports referenced above. Those of us who lived through, and barely survived, the telecom boom of the late 1990s can be forgiven for having a jaundice view of a new technology saving the telecom industry. 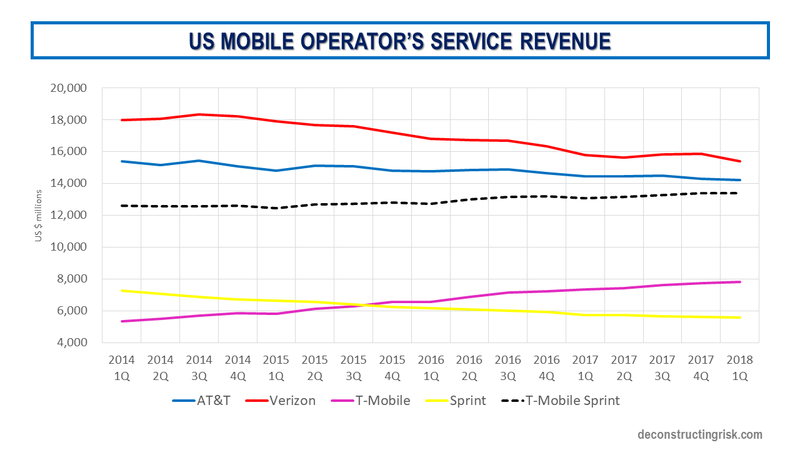 This blog illustrates some of the challenges facing the wired telecom sector and the graph below shows the pressures that the US mobile players are under in terms of recent trends in service revenues. The mobile service revenues trends are remarkably similar to those in the enterprise and wholesale space. The graph above also shows the rationale for the T-Mobile/Sprint merger in terms of size as well as the impact of T-Mobile’s aggressive pricing strategy. 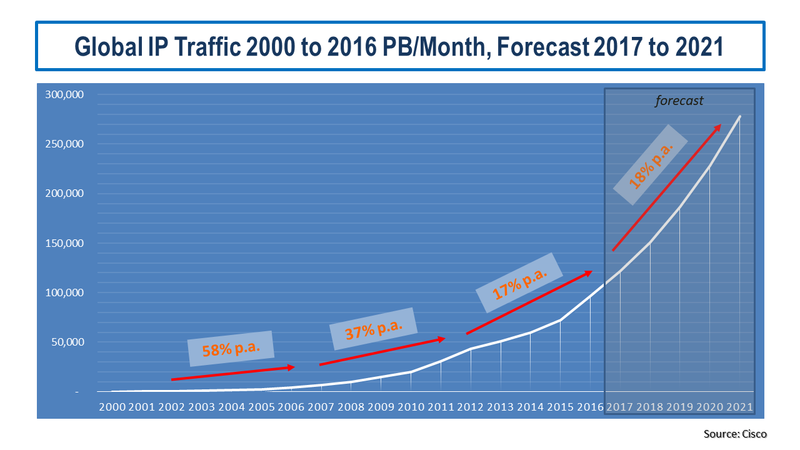 All these trends are in the context of the insatiable increase in bandwidth traffic, as illustrated by the IP figures from Cisco below. This report from 2017 by Oliver Wyman is one of the better ones and contains some illuminating context for the 5G era. 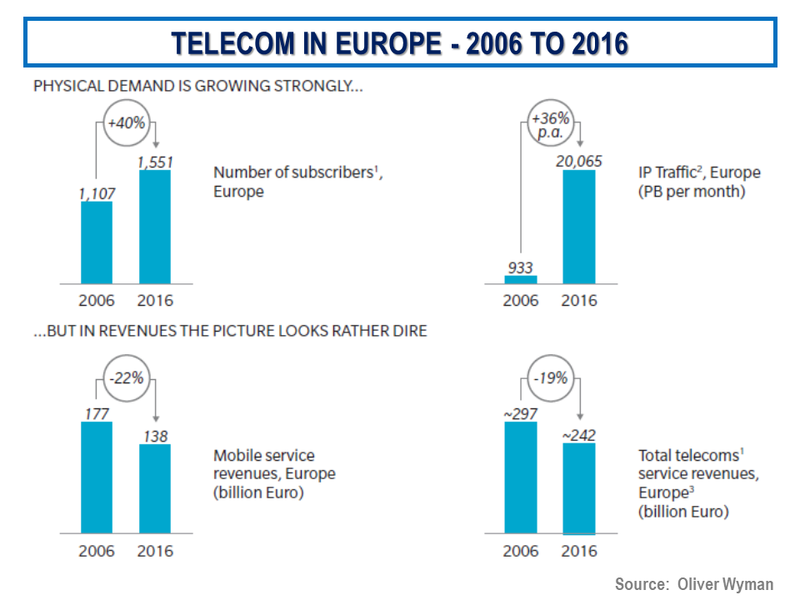 It shows that in Europe despite a 40% annual increase in mobile subscribers and a 36% annual increase in European IP traffic from 2006 to 2016, mobile service revenue and total telecom service revenue decreased by 22% and 19% respectively, as per the graphic below. 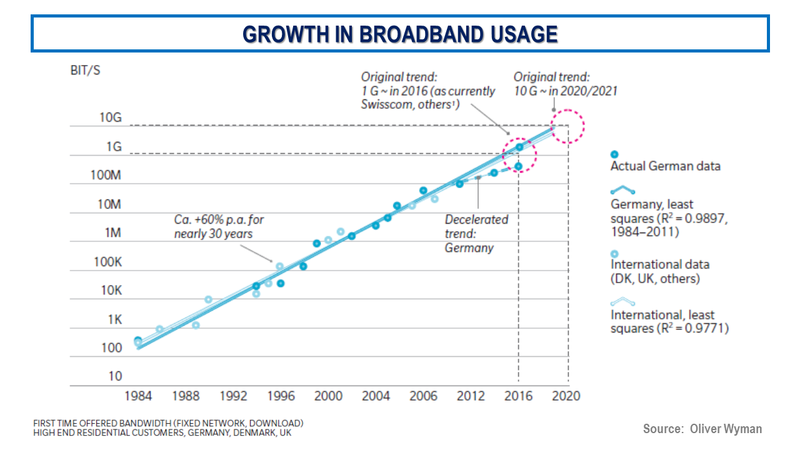 Another interesting graphic from the report, as below, is the historical and projected broadband usage. This 2017 report from Deloitte argues that “5G, across both the core and radio access network, stands to have a potentially greater impact on the overall ecosystem than any previous wireless generation”. Deloitte sees a “convergence of supply between wireline and wireless broadband, as almost all devices become connected over short-range wireless”. Deloitte concludes that “with an increasingly converged ecosystem of network and content players, an increasingly software-managed and defined physical networking space, and the demands and needs of consumers becoming complex enough that they no longer can manage individually, 5G and its associated technologies may have the power to reset the wireless landscape”. This paper from an Infinera executive called Jon Baldry highlights the need for “improvements to the overall network infrastructure in terms of performance, features and bandwidth” to support 5G “using software-defined networking (SDN) control and network functions virtualization (NFV) will play a major role in the optimization of the network”. I came across an interesting claim that SDN and network virtualisation can reduce opex and capex by 63% and 68% respectively compared to traditional telecom networking. Baldry concludes that “these improvements will drive new fiber builds, and fiber upgrades to an ever-growing number of cell sites, creating significant opportunity for cable MSOs and other wholesale operators to capture significant share of cell backhaul and fronthaul services for 4G and 5G mobile networks”. Whether all these investments and resulting new networks will halt the declining revenue trend for the telecom sector or merely provide a survival avenue for certain telecoms is something I have yet to be convinced about. One thing seems certain however and that is that tradition telecom models will change beyond recognition in the forthcoming 5G era. There is a sense of déjà vu when you read about the competing plans of Greg Wyler’s OneWeb and Elon Musk’s SpaceX to build a network of low earth orbit satellites to provide cheap broadband across the globe over the next few years. Memories of past failures from the late 1990s telecom bubble come to mind with these network plans. Names like Iridium, GlobalStar, Teledesic, and SkyBridge. Maybe, this time, the dreamers with access to billions can get it right! You never know, there may even be a comeback for broadband over power-lines (not likely according to this article)! I did come across the latest figures from Cisco in their “ The Zettabyte Era – Trends and Analysis” piece, as previously referenced in this post. As a reminder, gigabyte/terabyte/petabyte/exabyte/zettabyte/yottabyte is a kilobyte to the power of 3, 4, 5, 6, 7 and 8 respectively. 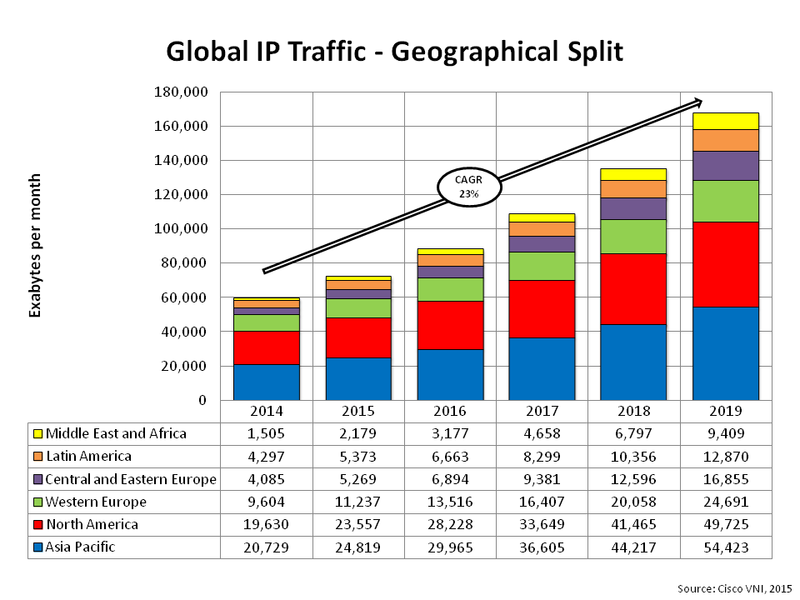 Cisco continues to predict a tripling of global IP traffic from 2014 to 2019. The graphics below give some colour on the detail behind the predictions. Split by consumer and business traffic with each further split by traffic type. Unsurprisingly consumer video traffic is dominating the consumer 24% CAGR. Growth in the US, Asia and Europe is driving the impressive 29% metro CAGR whilst Asia Pacific traffic is the prime driver for long-haul growth. The split by region shows the status quo will be maintained in terms of traffic breakdown with Central/Eastern Europe and the Middle East /Africa regions projected to have growth rates of 30%+ and 40%+ respectively as opposed to approx 20% in the main markets. 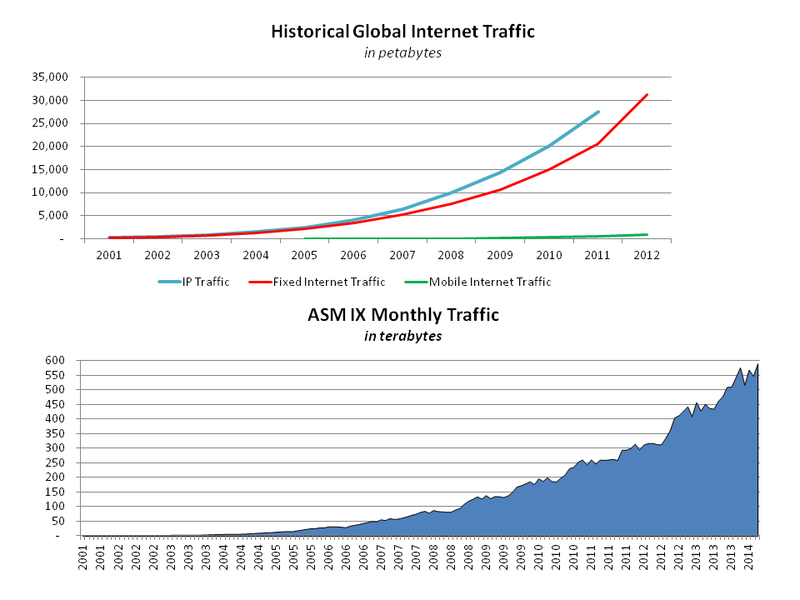 Exabytes are reaching their zenith and by next year global IP traffic is predicted to exceed a zettabyte. One of the great lessons of the internet crash was that the exponential growth in internet activity did not mean a similar level of growth in revenues for many of the new business models which were hyped. I can remember an insightful report before the crash which added up all the expected top-line growth projections and concluded that household expenditure on internet services would have to amount to 30% to 40% of household expenditures if projections were to be met!! Although on a personal basis household expenditure on internet access does seem to be growing all the time, it’s not at anything like the growth in our usage. Not yet anyway! For reference, gigabyte/terabyte/petabyte/exabyte/zettabyte/yottabyte is a kilobyte to the power of 3, 4, 5, 6, 7 and 8 respectively. According to the latest projections from Cisco in their report this month “ The Zettabyte Era – Trends and Analysis”, global IP traffic will surpass the zettabyte threshold by the end of 2016 growing by approximately 20% per annum. Global IP traffic has increased fivefold over the past 5 years, and Cisco predicts an increase of threefold over the next 5 years. 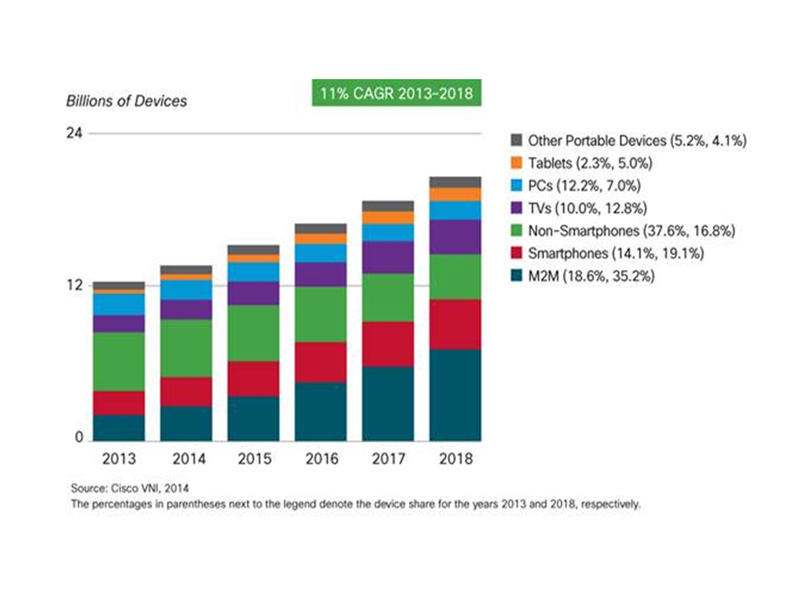 The graph below illustrates the changes in devices used to access the internet behind Cisco’s projections. 1)	Transition to newer devices will alter network demand and usage. 2)	M2M growth will drive the internet of everything. 3)	Fixed broadband speeds will nearly triple by 2018. 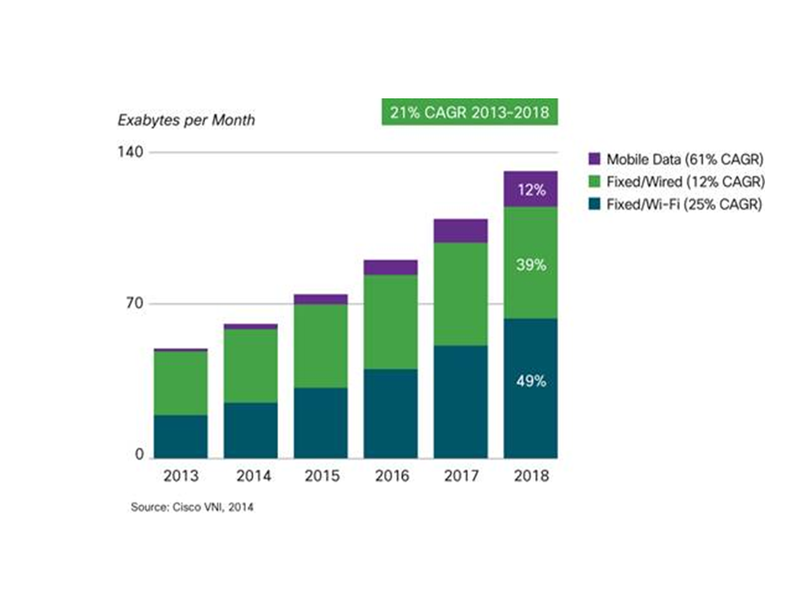 4)	Wi-Fi will dominate access technology. 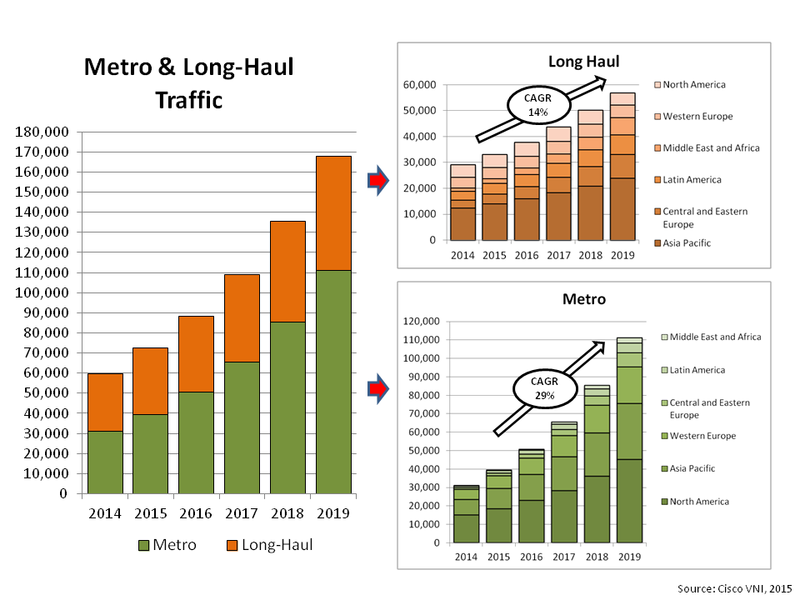 5)	Metro traffic will grow nearly twice as fast as long-haul traffic. 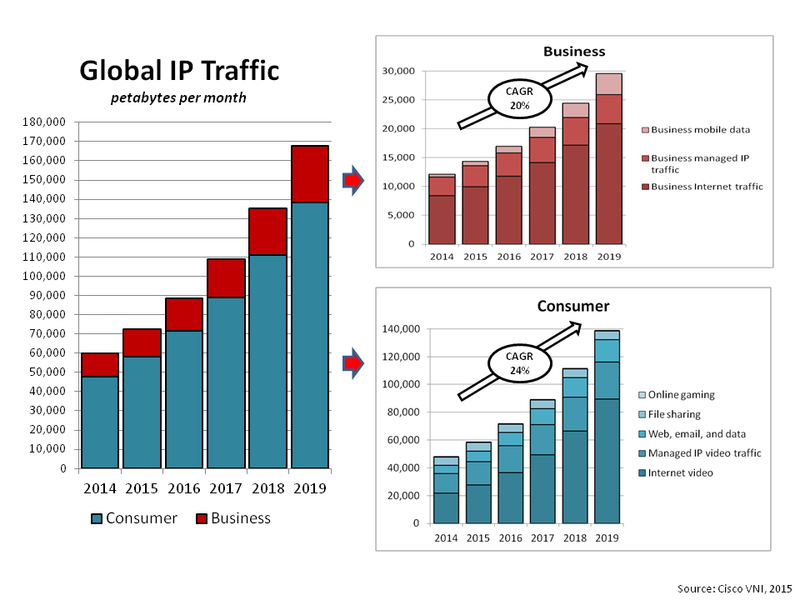 6)	IP video will accelerate IP traffic growth through 2018. 7)	Bottlenecks may result between peak and average demand times. Bring on the yotta era!